As part of the vacation rules of my recently-new employer, I had several days of vacation that I had to 'burn' during the month of September 2010. Well, I figured, since Jenn also has days off during this month, and since hiking mid-week during the fall season in the northeast is likely to be both scenic and quiet, why not take some time off and do a multi-day hike? 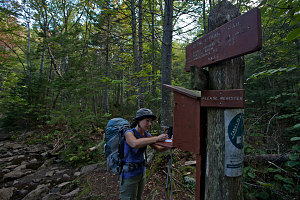 It was this line of thinking that led to this trip you see laid out before you in print (er... on-screen): a two-day backpacking traverse of the Rangeley-Stratton section of the Appalachian Trail in Maine. 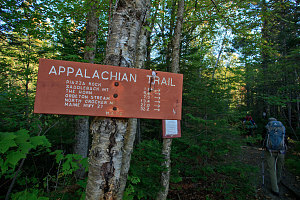 The Appalachian Trail, as some of you probably already know, is a very historic long-distance footpath that stretches from Northern Georgia to Northern Maine. It is/was likely the first ultra-long-distance hiking route, stretching over 2,100 miles (3,500 kilometres) from end-to-end. The A.T. is also probably the world's most famous long-distance hiking route; people from other continents regularly hike it. 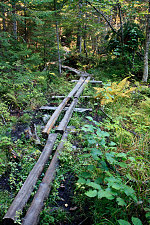 Those who complete the trail from end-to-end are known as 'thru-hikers', and are to be admired: although the maximum elevation on the A.T. is not that high, there is a lot of up-and-down and rough trail along its length. 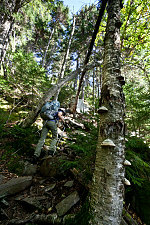 The above superlatives, however, aren't the primary reason why we chose to backpack a section of this esteemed trail. 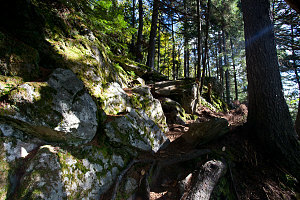 Rather, it was because the route of the A.T. from Rangeley to Stratton happens to either go over or runs very near to many of the NE 111er peaks that remain to be summited by me. In fact, on this backpack, we'd be able to climb at least six, possibly seven, of these peaks. The fact that we would be hiking a full stretch of the famous route was a nice bonus. We waited for a bit until we saw a good week-day weather forecast. This turned out to be September 20th and 21st - A monday and a tuesday. 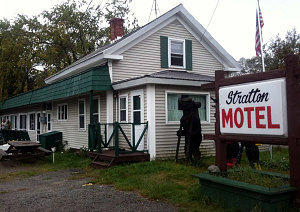 We drove down to the region on the sunday evening and stayed for the night at the Stratton Motel in Stratton, Maine. 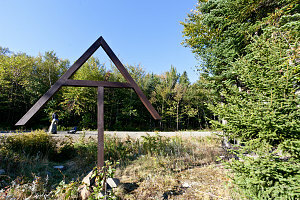 I chose the Stratton Motel because they are a very hiker-focused enterprise. Most importantly for us, they offer a trailhead shuttle service that we needed to use: since there was only two of us in one vehicle, we had no way of shuttling our vehicle to the far end of our traverse. 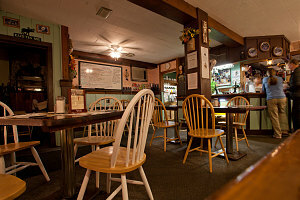 The fact that the motel offers very reasonable rates, free high-speed wi-fi internet, and a very knowledgeable proprietor only sweetened the deal. 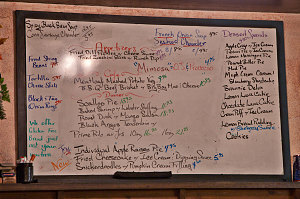 After arriving at the motel and arranging our shuttle time for the next morning, we were hungry for a good meal. 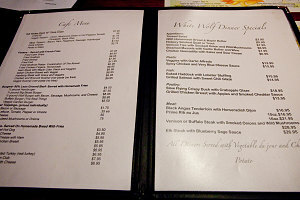 I remembered the good experience we had at the nearby White Wolf Inn's restaurant the month before after our Redington climb, and so we returned there for dinner. We chose one of the items on their specials board -- a meatloaf dish with vegetables -- and again, the experience did not disappoint. 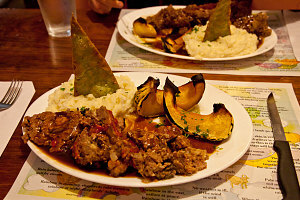 Everything was incredibly good - especially the baked yellow gourd vegetable that came with the meatloaf. I'm not sure precisely what type of gourd or squash it was, but it was very good. 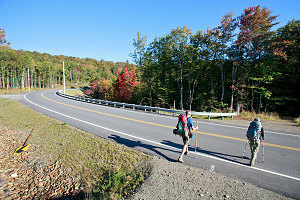 We walked back over to the Stratton Motel (the two places are only a few yards away from each other), got our gear ready for the next few days, and hit the sack. The next morning dawned totally clear, as promised by the weather forecast. 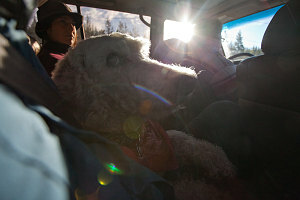 There was still a touch of frost about as we hoisted our packs into Susan's Land Cruiser for the shuttle ride to the trailhead. We had another hiker, Richard, who was shuttling along with us today: Susan was combining our two slightly different itineraries into one drive. We drove first along highway 27 to the A.T. junction, where I dropped off the CR-V, then up the Caribou Valley Road (which we had just been up last month on our hike up Mt Redington) to a point where Richard dropped off his pickup truck (Richard was also doing a similar traverse to ours, but finishing at the Caribou Valley Road rather than hiking all the way to highway 27). 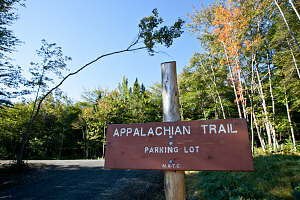 After the dropoffs, it was time for the long drive around to the A.T. trailhead on highway 4. Along the way, Susan's dog -- named Knucklehead -- decided that my lap was a good place for a nap, and so for most of the way I had his curly white furriness draped over me. We arrived at the A.T. / highway 4 trailhead shortly before 8:30am - a bit later than what would be ideal given the large distance we had to travel on our first segment. We therefore wasted no time in getting ready. After a quick look at the detailed trail sign at the entrance to the A.T. northbound at highway 4 (which showed some somewhat larger distances than I had anticipated), we were off. Richard was very soon pulling away into the distance, and we wouldn't see him again until camp later in the evening. During the shuttle ride, he had been making some noises about how his knees might slow him down, but there was certainly no indication of such a thing at that moment! 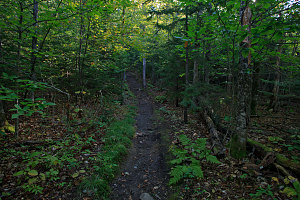 Following the characteristic white blazes that designate the route of the Appalachian Trail, we started off easily enough, heading slightly downhill on good tread before crossing a small creek and then heading moderately up a forested slope. 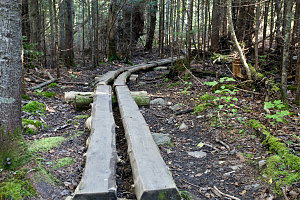 It was then a fairly level affair, with extensive planking in some places, and easy obstruction-free tread otherwise. The total distance from highway-to-highway along this traverse was likely to be in the 50km / 30 mile range (32.2 miles if the sign at route 4 was to be believed), and we wanted to get a larger-than-50% share of that done today. The way the designated campsites are laid out along the route meant that the most appropriate candidate for us was the Spaulding Lean-to, which sits at the base of Spaulding Mountain's summit cone - a considerable distance away. We therefore walked briskly, knowing that our total distance to get to that point was going to be at least 25 kilometers (16 miles), and very likely more, considering the distances we had just seen on recent signs. 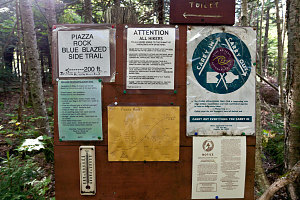 Within about 40 minutes we had arrived at the Piazza Rock area - the first of the designated camping areas along the Rangely-Stratton section of the Appalachian Trail. 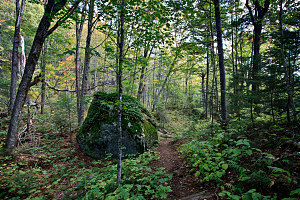 Piazza Rock is a large flat roof of stone that projects out of the hillside not far off of the trail. Given our desire to make good time, however, we did not stop to visit it (it is only a few hundred yards off of the A.T.). 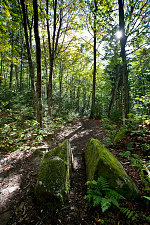 The A.T. continued mostly on the flats and gentle grades through beautiful open and leafy forest. 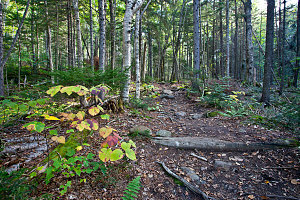 Fall had not yet touched this lower-elevation section of the trail, and everywhere was lush greenery and soft, spongy trail. 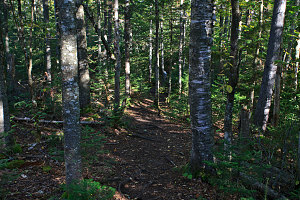 The path of the trail had been running parallel to and below a long and straight hillside. 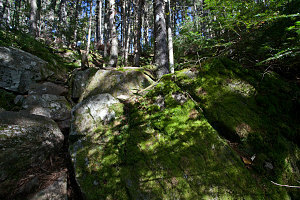 Finally, though, the trail suddenly turned left and headed up the hillside; first in a few switchbacks, and then straight up a steep slope with lots of big, moss-covered boulders. After a bit of this, the trail eased and then flattened off as we reached a small body of water (mostly grassy marsh and only a little bit of open water) called Ethel Pond. 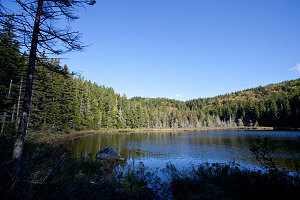 Above Ethel Pond, the trail started another less-steep ascent to a higher flat section of land that contained yet more ponds and small lakes. The largest of these -- called Eddy Pond -- is actually decently big, complete with a little island in its center. The A.T. from Ethel Pond to Eddy pond is somewhat rough. 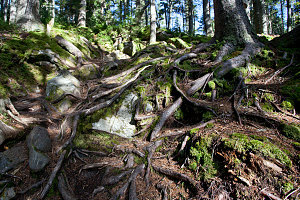 There are lots of 'root-y' sections and such.